A proposed strike has been suspended ahead of today's vote. Bus users are facing uncertainty after drivers announced 11 days of strikes amid a bitter row over new contracts. 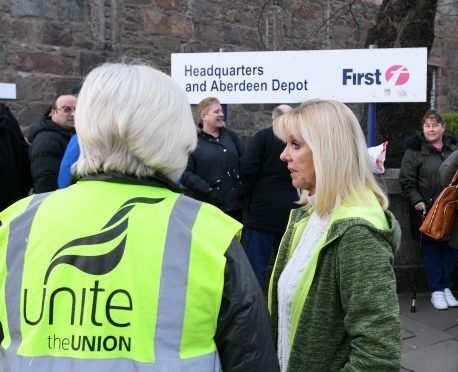 Union members employed by First Aberdeen decided on the drastic step yesterday, after 95% of 250 drivers polled said industrial action was the preferred method of resolving the disagreement. First chiefs are now plotting “revised timetables”, after describing the decision to strike as “disappointing”. But Unite union leaders stressed that the action could be called off if the bus firm is able to hold constructive talks with disgruntled workers. And rival bus operator Stagecoach last night revealed it had drawn up emergency plans to increase its journeys through Aberdeen and “keep the city moving”. The walkouts will begin on March 16, with a 24-hour strike and drivers will sit out entire days again on March 19, 21 and 23. Another strike, lasting seven days, will run from March 25 until April 1 – the day on which Unite says drivers have been told to either sign new contracts or risk losing their jobs. First Aberdeen disputes that claim and managing director, Andrew Jarvis, has accused drivers of failing to take into account the realities of the firm’s finances. He said: “We are disappointed that the union representatives and their members have decided in favour of industrial action. “We are operating in an extremely challenging economic climate, which has had a negative impact on the business. Mr Jarvis stressed that services would continue across the city during the strikes, with buses running either hourly or half-hourly “across the majority of our routes”. Drivers fear the new contracts will lead to less holiday entitlement, longer working hours and benefits being reduced. North East MSP, Lewis Macdonald, last night urged management to arrange those talks. Stagecoach will deploy extra buses and staff to its Aberdeen team during the industrial action.